In the heart of Pinellas County, a little oasis of natural Florida is hidden away on the SPC Seminole campus. I teach Composition 1 there and I know this is a popular site for staff and faculty. It’s a boardwalk park through Florida upland scrub. Here you’ll find tall pines covering an understory of palmetto bushes surrounded by a lily ponds. This landscape is the heart of the Florida environment and it is threatened by urban sprawl. Many of our students are new to college and new to Florida. So for their environmental sciences writing assignment, I take them to the Natural Habitat Trail on campus. They’re sure to see turtles, birds, and butterflies. If they’re lucky, they might see the otters playing in the ponds or a hawk sitting on a tree branch. A few hundred yards away a four-lane highway rumbles with traffic. So this is a kind of experiment to prove that this swampy Florida environment can still exist within an urban area. I celebrated the natural/urban juxtaposition with a project I called Poetry Spots, stickers with QR codes that link to a poetry webpage accessed via a smart phone. 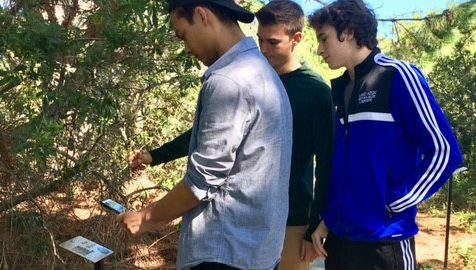 The picture below shows three of my students discovering poetry and botanical information as they walked the natural habitat trail.